Congratulations, Rae! Your “Make a Wish” card received the most votes in the last and final round, therefore Paper Crafts magazine is proud to name you our 2009 Gallery Idol! Many thanks to Making Memories for donating all of this fabulous product! Prizes aside, a big round of applause goes out to all of the finalists who have stuck with this competition week after week, round after round. Your creativity, passion and dedication to excellence have really made this little contest bigger and better than we could have ever imagined! We hope to see you back next summer for Season 4! P.P.S. I almost forgot today’s giveaway! It is Freebie Friday after all. 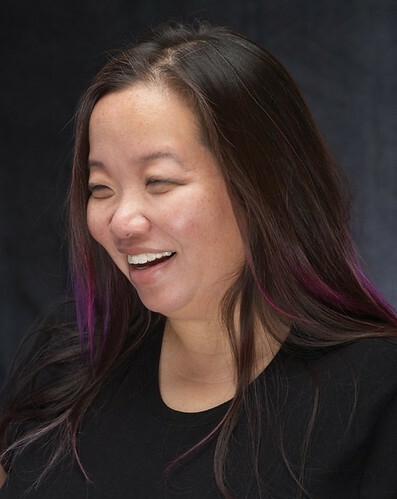 I hope you enjoyed reading Cath’s farewell post to our art director Stace Hasegawa. Since Stace LOVES the color black and tattoo art like skulls, wings, guitars, etc., today’s giveaway incorporates all of her favorite things! (The only thing missing is Johnny Depp in the flesh!) To be entered to win, leave a comment telling me a few of your favorite things. It can be anything at all. 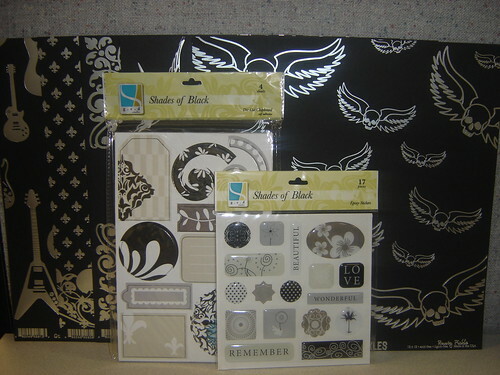 I’ll pick four winners to receive an assortment of metallic papers from Rusty Pickle’s Brass Knuckles collection, as well as black chipboard and stickers from GCD Studios. All comments must be received by midnight (MST) on Sunday, August 2. Four lucky winners will each take home this black-tastic prize package! I’m not gonna lie. These are my least favorite kinds of blog posts to write. You know, the ones where I have to talk about a beloved colleague who is moving on? I pretty much dread these. But Change is the game of life and as Jennifer mentioned in this post, as a result of this Change, we recently lost our beloved Art Director, Stace Hasegawa. Stace has been the Art Director here at Paper Crafts magazine since its inception. She is one of the most talented people I know in this business and she has established the Paper Crafts “look and feel” that you have come to know and love. The shots you see in the magazine are all directed by Stace. She determines the concept for how a feature will be shot based on our editorial goals and then she turns it up a notch. She sets up each shot, painstakingly arranging for props, lighting, and how the set will be dressed. She designs all the covers and determines how the magazine will look, how it will be laid out, how it will flow, and how you, the reader, perceive our brand. For this opener appearing in our November/December 2008 issue, Stace designed and cross-stitched everything herself. Believe it or not, there is nothing digital about this except the introductory text. Stace created the set for our Enchanted Forest feature in the September/October 2008 issue from scratch, making all the paper trees herself. It took unspeakable hours of time and unmentionable attention to detail. I love how Stace used the sky as a backdrop with real branches and real nests for our For the Birds feature in the March/April 2008 issue. This is, quite possibly, my favorite Stace opener of all time. 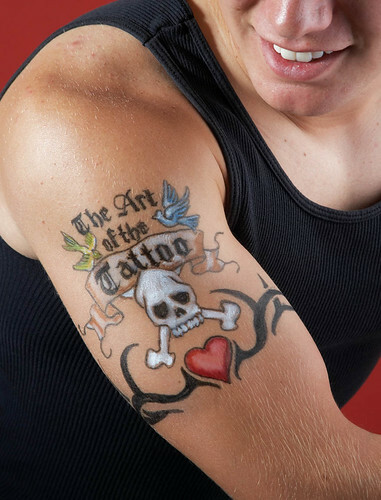 Hand-painted by the artist herself for our Art of the Tattoo feature in our October 2007 issue, I think Stace loves creating these out-of-the-box openers even more than we enjoy looking at them! 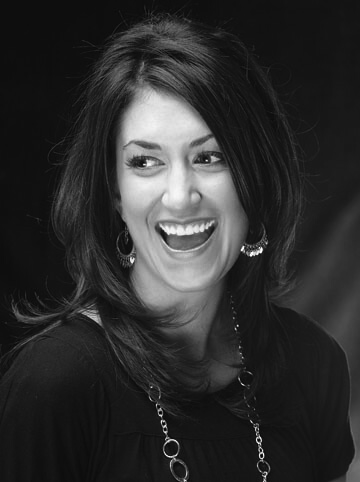 If you know anything at all about Stace, you know that she is known for her passion for all things Halloween. I’ll never forget the first time I met her. 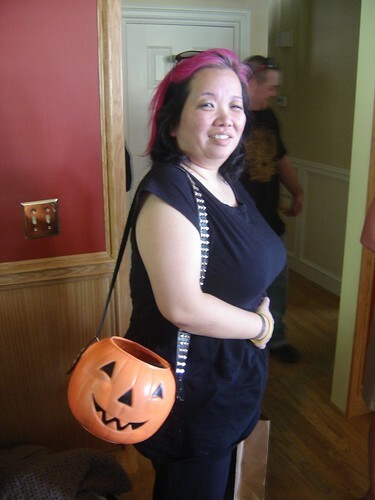 She came to a luncheon carrying a purse that she made out of a Jack-o-lantern bucket and a belt. It was May, and I remember thinking, wow, that’s brave…and cool…and wow, she must really like Halloween. Since Stace carries this Halloween bucket all year round, she's often been at the grocery store or mall and suddenly felt little hands searching the contents of her purse for some candy! We all did cartwheels when we saw that Stace had “suspended” these cards in mid-air! And while Stace has brought an unbelievable attention to detail, an over-the-top approach to every task she’s given, and a set of standards that raises the bar for all around her, I think, selfishly, what I’m going to miss the most about Stace is the love that she brings to our team. When it’s tough around the office, Stace is there with ice cream bars. 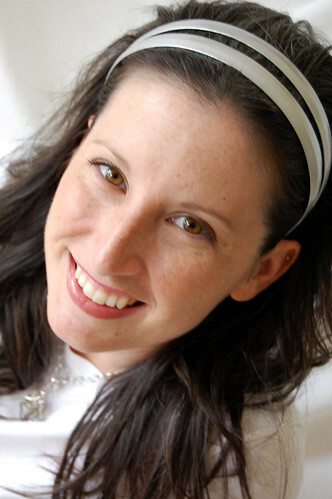 She’s the mastermind behind our beautifully handmade Christmas cards, our award-winning Halloween costumes, and our freebies at tradeshows and events. You’ve seen what she does with our birthday signs and cakes! And when there’s a holiday, it seems that she’s always leaving little gifts for us which she thinks are anonymous, but it’s a dead give-away when what she’s left on your desk is so far beyond what anyone else would have done. She is, in three words, a most excellent friend. 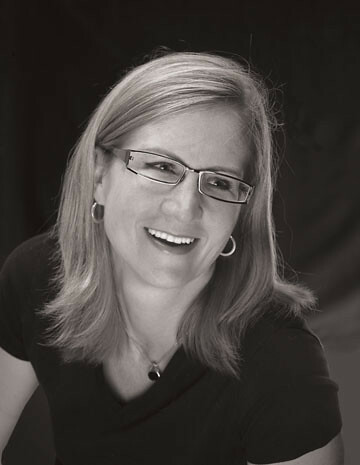 Yes, it’s hard to imagine what life will be like around here without our beloved Stace, but we know that her opportunities outside our folds are innumerable, and we wish her every success. It’s hard to say good-bye, Stace, but even though we won’t be working together anymore, I know we will always be friends. When I was a little girl, my mother taught me how to cross-stitch. I started with plastic cross-stitch material and a piece of yarn with masking tape on one end. I would very carefully thread it through the squares, creating little X’s that then turned into butterflies, flowers and hearts. With a little practice, I then moved on to Aida Cloth and made more intricate designs and pictures with floss and a needle. This became a favorite pastime as I grew up. I haven’t done cross-stitch in many, many years. Recently I decided that I wanted to share this little hobby with my own daughter, since I enjoyed it so much at her age. I found a cute pattern on the Internet of a puppy, and she helped pick the colors of floss that she would use to create this little dog. My daughter Kayli's very first cross-stitch! Once I transferred the pattern onto the Aida Cloth, Kayli has been hard at work on her design. It’s been so fun to watch her as she very carefully pulls the floss through the material, and see her eyes light up as she watches the puppy come to life. 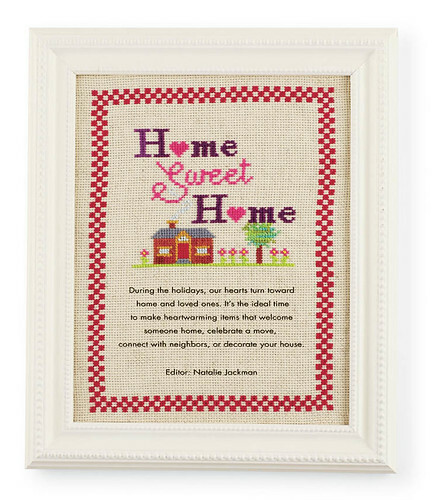 Cross-stitching is a fun and relaxing hobby that many have enjoyed for generations. Did you know that you can cross-stitch on many different materials such as plastic, fabric and paper? This very easy technique can also be used on your paper crafting projects! 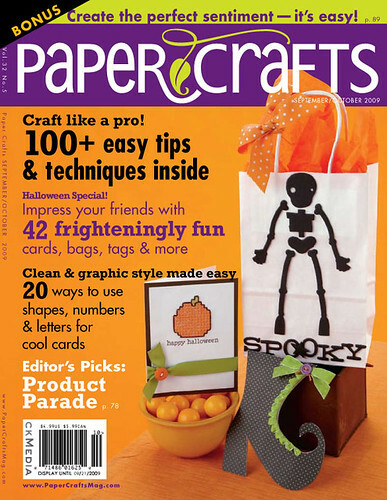 Did you also know that Paper Crafts September/October issue has just hit the newsstands?! I created a Halloween card that I cross-stitched on white cardstock. My cute little pumpkin came to life with orange, green and brown floss, as I carefully put into place each little X.
Stitched Pumpkin Greetings Card (p. 60) from the September/October issue. 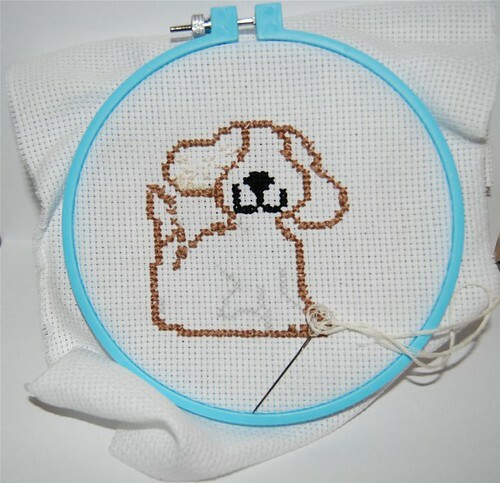 If you don’t know how to cross-stitch, there are many different tutorials and patterns on the Internet that you can transfer onto your projects. 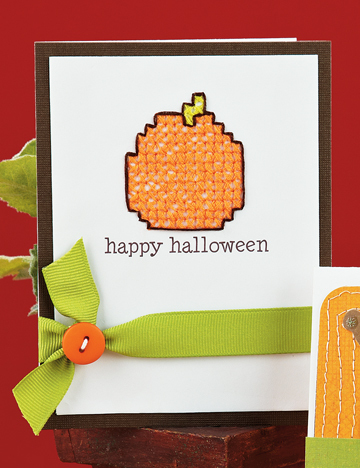 In fact, you can download the pattern for my pumpkin card right here! I encourage you to give it a try! P.S. Have you been following the Gallery Idol competition? I was so impressed with the Top 5’s humor cards – they really left me “in stitches”! Kelly wanted me to remind everyone that voting ends at noon (MST) tomorrow. Click here to view the Top 5’s entries and to vote for your favorite design! Get Spooked with our September/October Issue! Hip, Hip Hooray…we’re off to C.H.A.! Cath and Susan are, right this very minute, roaming the floor of the Craft & Hobby Association Summer Show in Orlando – checking out the goods and bringing back a full report on all the delicious new products being released for fall and winter. Start drooling now…we’re here to get you in the spirit! And I want to get you in the spirit of our September/October issue (that goes on sale TODAY! ), but first I want to touch on one little bit of housekeeping. Some of you may have heard that CK Media (parent company of Paper Crafts magazine) was sold. The dust has settled, our name was changed to Creative Crafts Group, and we’re now an affiliate of New Track Media. Other than losing our beloved Art Director in the shuffle (more on that in a few days), we’re still here every day, putting together this magazine that we all love so very much. So, right on schedule, here’s our September/October issue, packed full of fun for Halloween and sweater weather (and I hope you didn’t miss Cath’s Moxie Fab sneak peek last Friday!). Our spooktacular September/October 2009 issue! Click on this cover image to order your copy today! There’s something extra special fun about this issue, too – a You’ve Been BOOed sign that was custom-illustrated by our Lone Design Man Matt Anderson. I had so much fun BOOing people around the office last year that I asked Matt to help us share the fun with you in our own Paper Crafts way this year. Share a little BOO! with your neighbors or co-workers this Halloween! 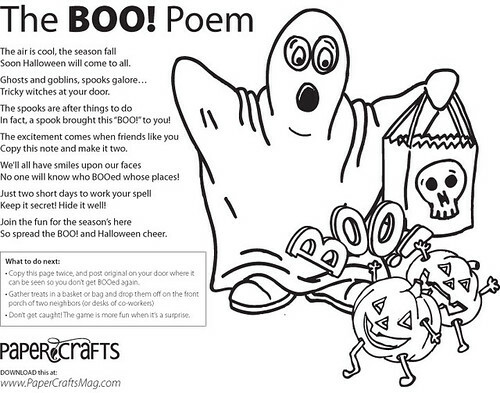 Use it as is or let the little artists in your life put color in the pumpkins and spook in the skeleton. You can download the pdf HERE. Have fun, and spread the BOO! spirit around your neighborhood or office this year. Tell ‘em Jennifer sent you. Hee Hee! Magazine Monday – Vote for YOUR Gallery Idol! Way to go, Top 5! You certainly had me giggling! If you’d like to show your support, please vote for your favorite humor card here. (If you haven’t already registered with our contest tool, you’ll need to create an username and password.) Voting will run through noon (MST) on Thursday, July 30. The grand prize winner will be announced on Friday, July 31. Make sure you check back here to see who takes home this fabulous prize package, courtesy of Making Memories! Gallery Idol's grand prize winner will take home all this fun! May the queen of funny reign supreme! Congrats, ladies! You’ve each won Inkadinkado’s Tell it Like it is stamp set, You Stand Out Kid Quotes stamp and BasicGrey’s Offbeat collection. I’ll be e-mailing you shortly for your mailing addresses. Thanks to all who left so many humorous kid quotes! Freebie Friday – Gallery Idol Top 5! Welcome to another Freebie Friday! Well, we’ve finally announced all six of our Paper Crafts Go-to Gals! We hope you’ve enjoying reading their spotlights and getting to know their individual styles and voices. You’ll be hearing A LOT from these talented ladies… not only in our future magazines, but right here on this blog. So start thinking of questions you have for them. No paper crafting subject is off limits! In fact, if you happen to already have a design question, feel free to start e-mailing them at gotogals@papercraftsmag.com. We can’t promise they will all be answered, but if we select your question for an upcoming column or blog post, we’ll definitely be in touch. These six Go-to Gals are ready to instruct, inspire and knock your socks off with their boundless creativity! Congrats, ladies! You’ve made it to the fourth and final round of Gallery Idol! By making it into our Top 5, you’ve each won a free copy of Paper Crafts Gourmet and this fantastic prize package, courtesy of K&Company! 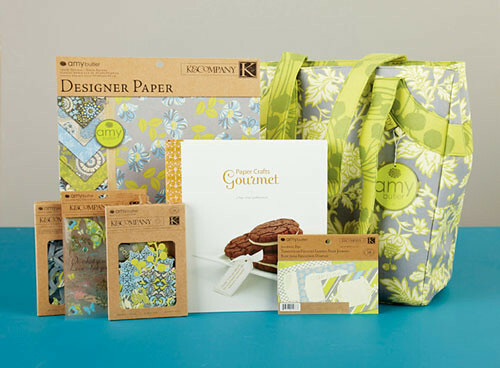 Top 5 Prize Package: K&Company's Amy Butler Scrapbooking Tote Bag, Lotus Faded China collection and a copy of Paper Crafts Gourmet. Top 5, are you ready for your final theme? Round 4’s theme is… humor! We want you to make us laugh! Feel free to incorporate jokes, riddles, quotes or your own funny bone! The one finalist who clearly conceptualizes, designs and posts the most humorous card will be crowned this year’s Gallery Idol winner. The deadline for submissions is next Monday, July 27 at 9 a.m. (MST). All “Humor” cards must be posted to our gallery by this time. Voting for Round 4 will begin at noon! Best of luck, Top 5! P.S. Since it’s Freebie Friday, it’s time for knock knock joke! (I know… better stick with my day job!) To go along with Gallery Idol’s next theme of humor, I’m giving away three prize packages featuring Inkadinkado’s Tell it Like it is stamp set, You Stand Out Kid Quotes stamp and BasicGrey’s Offbeat collection (which features peas, among other things). I just love these stamps with the kiddie quotes! They don’t mean to be funny, but kids sure say the darnedest things sometimes. To be entered to win, leave a comment telling me the funniest thing a child has ever told you. All comments must be received by midnight (MST) on Sunday, July 26. I’ll announce the three winners on Monday’s blog. Three lucky winners will each take home this prize package! Congrats, winners! Each of you will receive one of Sue’s Bliss card-making kits (valued at $19)! I’ll be contacting you shortly to get your mailing addresses. Thanks to all who left so many blissful comments! 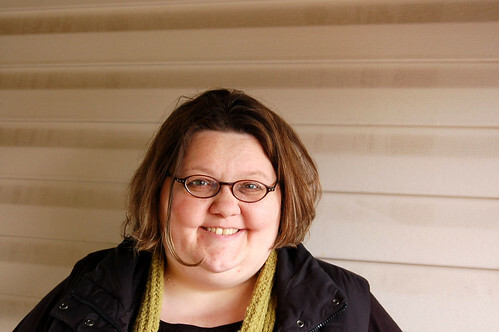 Welcome Go-to Gal, Teri Anderson! That jokester! Just another reason why we love this gal… Besides her quick wit, Teri’s instantly recognizable simple and graphic designs certainly inspire me, and we look forward to sharing her talents with you, our readers! So sit back a bit and learn some fascinating stuff about totally talented Teri! 1. Where did you grow up? I grew up in the Pacific Northwest near Portland, Oregon. 2. Do you work outside the home? If so, what do you do? I occasionally work a day here and there as an extra for movies. I’ve been an extra for Untraceable, The Burning Plain, and a yet untitled movie starring Harrison Ford, Keri Russell, and Brendan Fraser. I’ve been on a call a few times for other projects as well. 3. If a movie were to be made of your life, who would you cast to play the part of you? Drew Barrymore. It seems like she doesn’t take herself too seriously. 4. What song would you choose as the theme song for your life? “Don’t Stop Believin’” by Journey. 5. What is one thing most people would be surprised to hear about you? I once spent a summer as an intern for a professional roller hockey team. I wrote post-game press releases, represented the team at a couple small-town parades, gave players rides home, and did pretty much anything else asked of me. 6. What/who inspired you to start paper crafting? I saw Becky Higgins’ Creative Cards: The Complete Guide to Card Making book. I had scrapbooked and made a few cards with stamps before that, but Becky’s book really clicked with me. 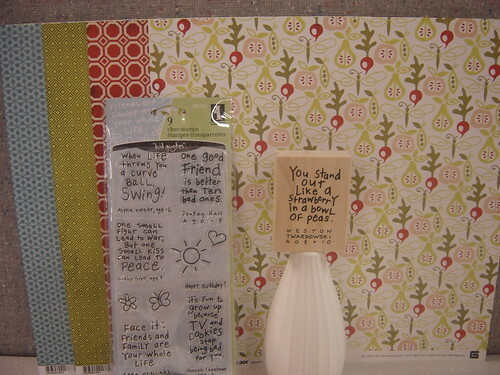 It inspired me to use supplies I’d been using for scrapbook pages on cards. Six or seven years later I’m still making cards. 7. 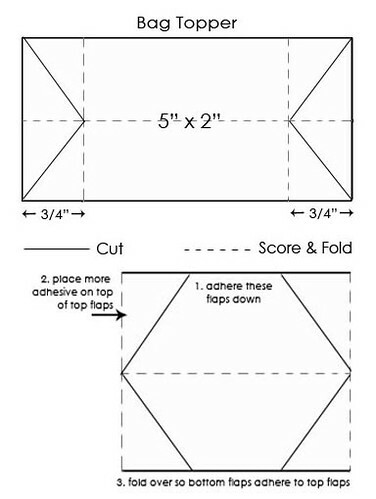 What is your biggest paper crafting challenge? No matter how many times I say that I won’t hoard, I think it will always be using up those special things I’ve tucked away. 8. 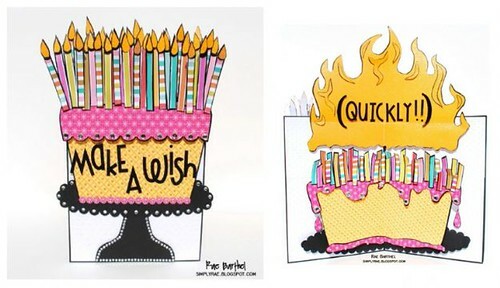 If you were only allowed two items to create a card beside cardstock and adhesive, what would they be? Letter stickers and a corner rounder. 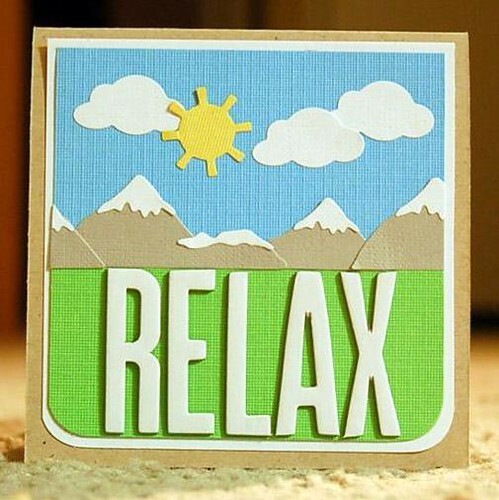 Teri’s Relax Card is soothing with its simple and serene landscape. 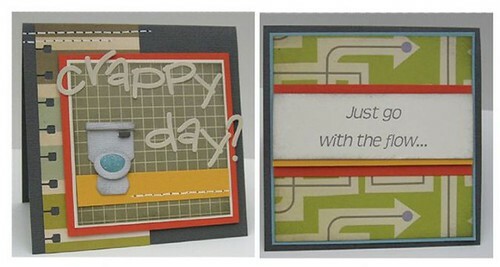 It was featured in Card Creations: Quick & Easy, which means you can make it in 5 steps or less! 9. 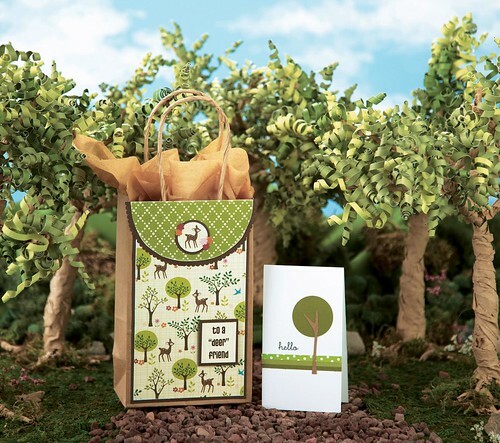 What is your favorite occasion or holiday to paper craft and why? I love to make general occasion cards. I also have a thing for making encouragement and sympathy cards. I really like the challenge of trying to come up with just the right words for those situations. 10. How would you describe your style? Paper crafting for the busy gal or guy. I tend to make projects that do not take a lot of time. My style is simple yet a little bit funky with a few flecks of technique on top. I stray once in awhile, but I am generally happiest with my simplest projects. 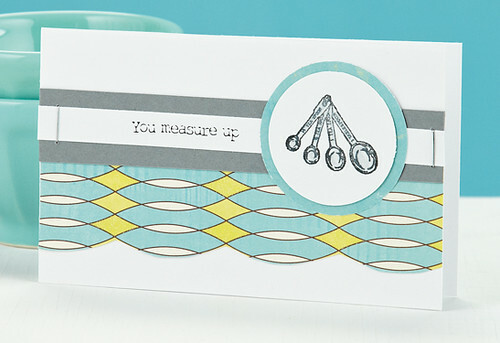 Teri's You Measure Up Card appears in our upcoming September/October issue. 11.When is your favorite time to craft? I’m a total night owl, so I love working late at night. 12. What sort of music do you listen to while crafting? I make no secret that I have great appreciation for John Mayer’s music, but I also like a lot of other musicians. Nirvana, Jessica Harp, Goo Goo Dolls, The Rolling Stones, Sheryl Crow, Maroon 5 and the Lovehammers are also favorites of mine. 13. How does your family participate in your paper crafting passion? My mom does it, too. We like to go to conventions and crops together. 14. When it comes to calls and deadlines, how do you keep yourself organized? I keep lists. I have a clipboard which has assignments and calls that I want to work on and follow-up work I need to do. 15. Do you remember what Paper Crafts issue your first project appeared in? How has your style changed since then? I had a tag in the second issue of Paper Crafts. It was a baby tag and had cute baby stickers on it. My style has changed a few times since then but has finally settled on a “less is more” look. 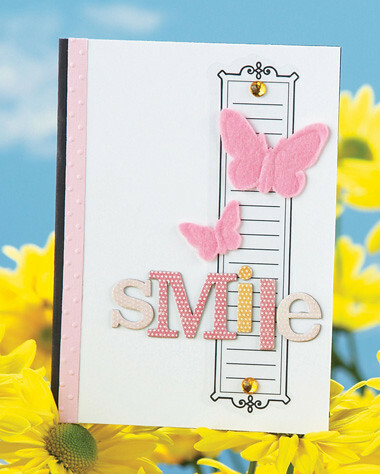 Teri's Smile Card was featured in our March/April 2009 issue. 16. 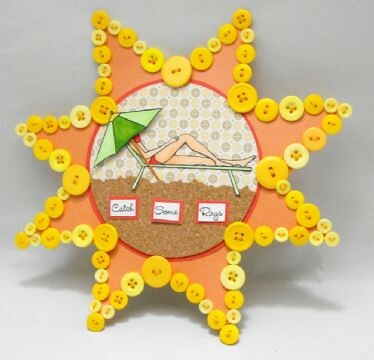 What are you looking forward to most about being a Paper Crafts Go to Gal? Um. Pretty much everything. 17. Have you contributed to any design teams in the past or present? If so, which ones? I’m currently on one design team, a rubber stamp company called Art Declassified. In the past I’ve also been on the design teams for Wordsworth, Paper Love Designs and SEI. I also did some design work for Webster’s Pages in their early days. 18. Name three designers whose styles you like and why they appeal to you. Danni Reid has such a simply complicated style that I just love. Her cards are so clean, but they have a lot of great little details that put them over the top. 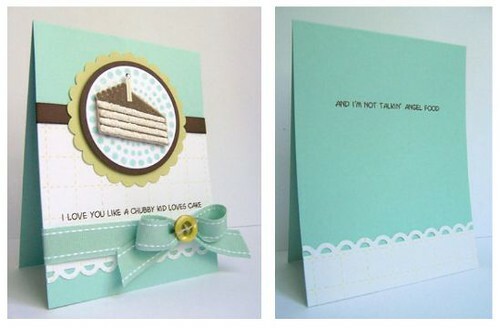 Alli Miles makes so many cheery, stamped cards. They make me want to dig out my stamps and play. 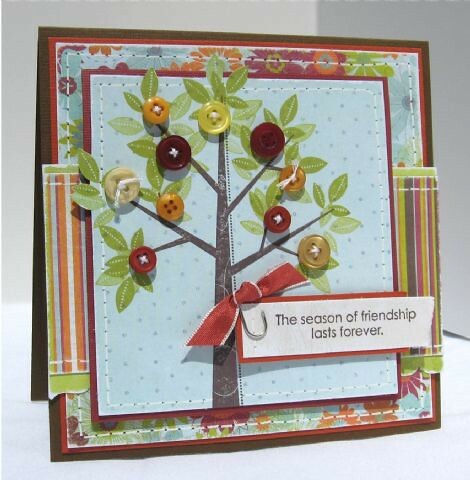 Linda Beeson is a card maker whom I have admired for years. She is one of the first designers who caught my eye in Paper Crafts because her cards are so well-designed and thought out. It always excites me to see one of her projects. 19. Do you have any advice/tips for someone who’s never been published or who wants to submit for the first time? Don’t fuss over submitting, just take the chance. Pick a call you like, make a couple cards and submit. If they do not get picked up, don’t give up. Try again. Try not to lose your joy for paper crafting. If submitting takes the fun out of it for you, take a breather and step back a minute. No one is going to get mad at you for not submitting. Just enjoying the paper crafting process. Wow! It’s amazing to think that we have a movie star in our midst. I, for one, am a little star struck! And I’m so with you, Teri – Don’t Stop Believin’! 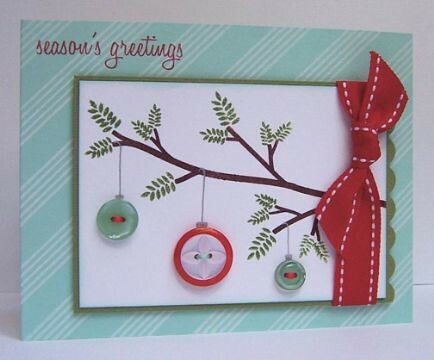 Head on over to Teri’s blog, and see her card of the day. 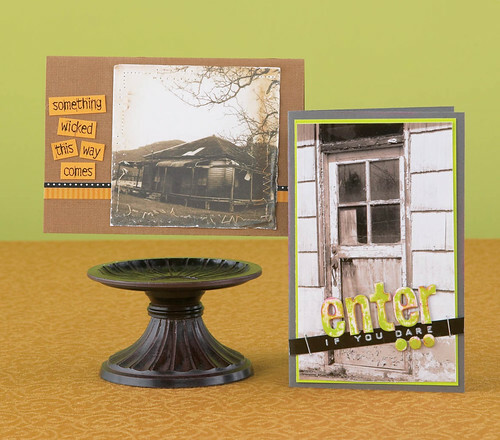 Her cute cards seem almost like little people since Teri asks her readers to “meet” each card. And you’ll definitely benefit from her tips and techniques that she throws in each day. 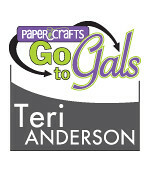 So let’s give Teri a ton of Paper Crafts love today and a big high-five for being a Paper Crafts Go-to Gal! I’ll pick five lucky people to receive three sets of Art Declassified stamps. All comments must be received by midnight (MDT) on Friday, July 24. The winners will be announced on Monday’s blog! P.S. Today is the last day to vote for our button-themed round of Gallery Idol! Click here to see the Top 10’s cards and to vote for your favorite project. Note: Voting ends at 12:00 p.m. (MST), so make sure you get to the “polls” early! And check back here tomorrow when we announce the Top 5 finalists! Congrats, ladies! You’ve each won a copy of Stamp It! Cards and some itty bitty stamps. Kelly will be contacting you shortly to get your mailing addresses. Thanks to all who left comments for Jessica! Certainly, the best part of being a PC Pro has been getting to share my paper crafting passion with so many like-minded ladies (and a few men!). Today I want to share my passion for the baby bunny buggy baggy. Say that five times fast! 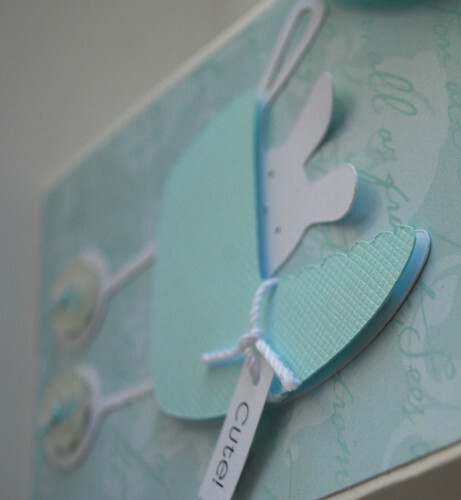 Everything about this gift bag speaks baby – buttons, scallops… even this tranquil aqua color. But the real star is the adorable baby bunny buggy die-cut from the Cricut ZooBalloo cartridge. Don’t forget to add foam squares, dot his eyes and curl his bunny ears to make him come to life! If you like this project, you’re in luck! 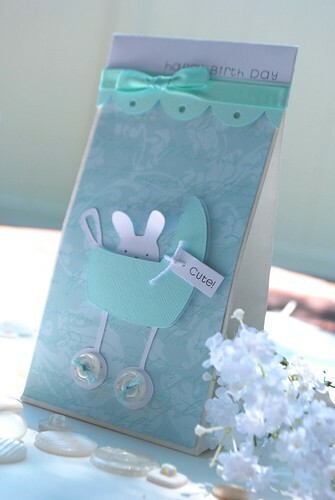 I’m giving away five of my Bliss card-making kits ($19 value), which includes this baby gift bag. Leave a comment telling me your idea of bliss. All comments must be received by midnight (MST) on Thursday, June 23. The winners will be announced on Friday’s blog! P.S. I loved incorporating buttons into the wheels of my baby bunny buggy. Wanna see some other creative uses of buttons? Check out this week’s round of Gallery Idol! And make sure you vote for your favorite button design here! 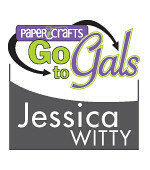 Welcome Go-to Gal, Jessica Witty! Are you all enjoying meeting our Go-to Gals as much as we are enjoying introducing them? Tuesdays and Thursdays have taken on a whole new meaning in our parts. Well, I don’t want to tease you any longer (we are pretending you haven’t already read the title and you are desperate with suspense). Today I have the great privilege of introducing the amazing Ms. Jessica Witty! Jessica is an uber talented stamper with a brilliant way with both words and paper. Jessica is the proud mama of three bitty Wittys and has a personality that is dynamite (just wait until you read some of her responses). If being amazingly talented and intelligent wasn’t enough, Jessica is also a fountain of fabulous tips and tricks (get the perfect bow every time by flipping your project upside down and then tying your ribbon… I’ve tried this and it TOTALLY works!). So, are you ready to meet this long lost sister of Punky Brewster? 1. Where did you grow up? I spent most of my growing up years deep in the heart of Texas. In fact, my husband and I still live a few miles from our childhood homes. 2. Do you work outside the home? If so, what do you do? 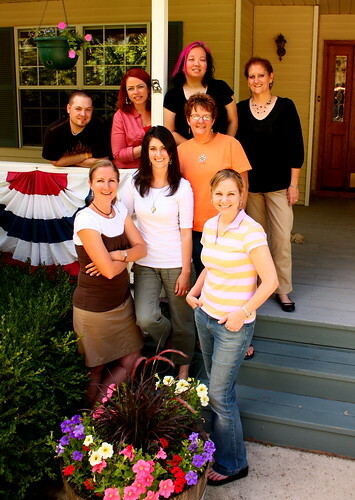 In my pre-SAHM days, I worked as a radio script editor and writer for an internationally broadcast radio ministry. I’ve been a SAHM for a few years and I enjoy the craziness that defines my life now! 3. If a movie were to be made of your life, who would you cast to play the part of you? 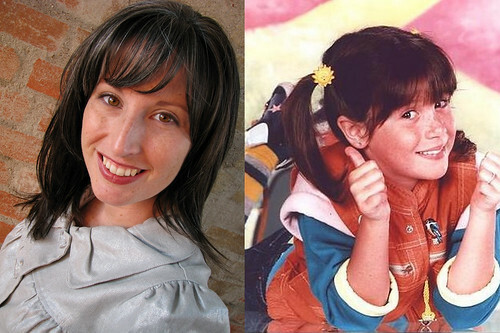 Oh, good grief… um… the girl who used to play Punky Brewster? Punky and I used to be twins back in the 80’s. Jessica and Punky... separated at birth? 4. What song would you choose as the theme song for your life? “Walkin’ on Sunshine” by Katrina and the Waves. And for a more serious choice, “Be Thou My Vision”. 5. What is one thing most people would be surprised to hear about you? I have three first-born children. Seriously! Two of my three kids are adopted, and both times we had no idea we would be adopting before we were asked to. With baby #3 (Noelle) we only had seven days time between being asked to adopt and being at the hospital for her arrival. That was only 11 weeks ago, so my head is still spinning! 6. What/who inspired you to start paper crafting? Like so many of you, I’ve always been crafty. However, I *cannot* draw. At all. No sketching skills whatsoever. I always struggled with that because I felt like it meant I couldn’t really be “artsy”. I was totally intrigued when a friend of mine invited me to a stamping party seven years ago. Creative expression using paper and ink but not requiring the ability to draw?! Sign me up! 7. What is your biggest paper crafting challenge? In this season of life… TIME! I have three kids (two of them under the age of two) and all that comes along with it, so my time is definitely limited. That means that I have to be ready to create right when I sit down at my table… and that’s hard for me. Perfectionism is my other battle, and a lack of time + perfectionism just do not equal good results! Honestly, I like to plan out my entire project, down to every detail, before I even put one stamp to paper or make one cut. Lately I’ve been trying to focus on being willing to make mistakes for the sake of getting started and letting my creativity come out during the process. 8. 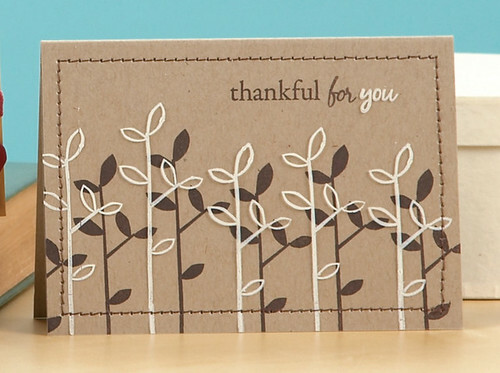 If you were only allowed two items to create a card beside cardstock and adhesive, what would they be? Stamps and ink, no question! My one embellishment necessity would be ribbon. Followed closely by buttons. Huh… apparently I need more than I thought! 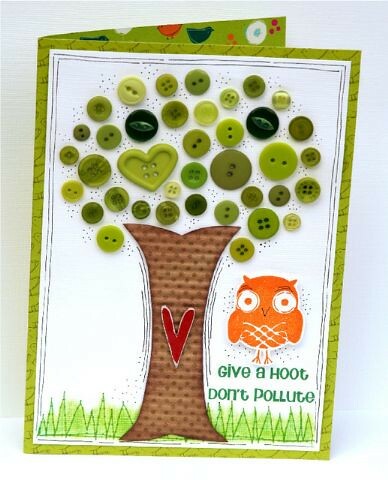 I love the way Jessica transformed plain kraft cardstock into this amazing card with a few stamps and a little ink – now THAT is talent! 9. 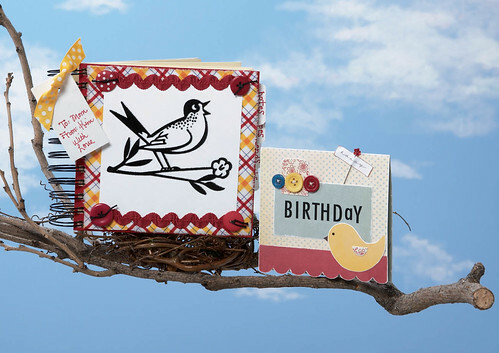 What is your favorite occasion or holiday to paper craft and why? Lately, that would be thank you cards! (I still have many, many to make!) 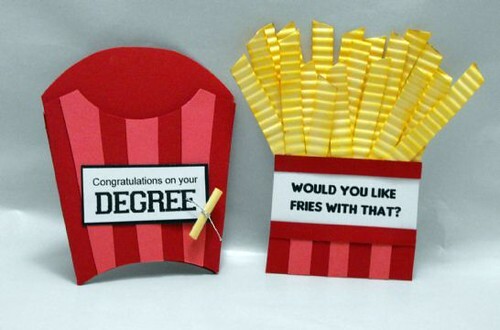 Generally, I’d say either all occasion/friendship or thank you cards. 10. When is your favorite time to craft? Naptime! (The kids’ naptime, not mine!) I used to pull a lot of all-nighters to craft, but that habit went by the wayside as more kids came along and I passed the 30-year mark. 11. What sort of music do you listen to while crafting? None! And for the record, I am so technologically disabled that I could actually be the last person on earth to get an iPod. My work table (a.k.a. dining room table) faces the living room, so I’m generally listening to the oh-so-soothing sounds of my children. 12. How does your family participate in your paper crafting passion? My oldest son now has an obsession for paper as well… he says he is going to be a “paper collector” when he grows up! He likes to make his own books and art projects at his little table while I’m working at mine. At Christmas, my husband pitches in with what we affectionately call The-Witty-Family-Christmas-Card-Sweatshop. 13. When it comes to calls and deadlines, how do you keep yourself organized? To be honest, organization is really not my middle name. I finally got a daily planner specifically for my design work and that works really well for me. I track due dates on the monthly layouts, print out any assignment and call details and paper clip them in the appropriate weeks. I also use the daily sections to write and sketch out my project ideas. 14. Do you remember what Paper Crafts issue your first project appeared in? How has your style changed since then? My very first issue was November 2006 when my first and second submissions ever won spots in the Stamping Royalty contest that year. I’ve definitely refined my style since then… I tend to use much more white space now. 15. What are you looking forward to most about being a Paper Crafts Go-to Gal? You know, the fame… fortune… paparazzi, etc. HA! I’m so looking forward to getting an inside glimpse into the inner workings of Paper Crafts, the challenges that come with our assignments, and continuing to be inspired by what has always been my favorite magazine. This is a long-time goal realized for me and I’m so grateful and excited for the opportunity! 16. Have you contributed to any design teams in the past or present? If so, which ones? I was previously a designer with Paper Salon and I currently design for Emma’s Paperie. Julie Ebersole was the very first designer who totally struck me years ago with her designs and is still inspiring me to this day. I love her ability to pair brilliant ideas with an editorial eye. Nichole Heady always grabs me with her simple elegance. Melissa Phillips and Anabelle O’Malley simply because their styles are so different than mine! I analyze their work to see how they layer and put things together and try to incorporate the feeling of whimsy they have into my own designs. 18. Do you have any advice/tips for someone who’s never been published or who wants to submit for the first time? Focus on your strengths and refine them! Figure out your comfort zone, become proficient at it, then move beyond it. And submit every project along the way! It’s been said before, but you just never know what will be a winner. 19. How would you describe your style? I am definitely a less is more, simple and graphic with clean lines and lots of white space kind of designer. My goal is generally to do more with less, to use what I have, to edit as much as possible while keeping a big visual punch, and to do all of that in a short time frame. Layering and embellishments are definitely a challenge for me… two layers on a card is a lot of layers to me! White space is my friend. I’d say white space is Jessica’s friend! The white space on this gem (from Stamp It! 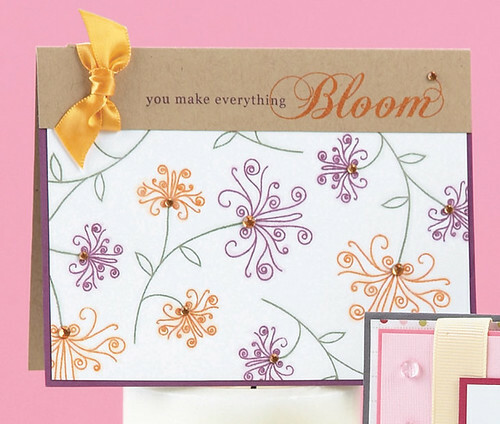 Cards) really lets the swirly flowers and simple sentiment do the talkin’. 20. Do you have a blog or online gallery? If so, please provide the URL. You can find my work at Emma’s Paperie and I still work with my designer friends from Paper Salon. You can also see my gallery at splitcoaststampers.com. I just launched my blog, and it’s still a little bare but I’ll be posting links and other good things very soon. I’m on Facebook, too. I told ya… tons of personality in this one! Thanks, Jessica for answering these questions. I for one can’t wait to see all your brilliant projects and read your great tips in the upcoming issues of Paper Crafts. Make sure you leave sweet Jessica a comment before you run off to check out all the cool stuff she mentioned in her answers. In honor of her three itty bitty Wittys (I just love saying that! ), I’ll pick three winners to win a copy of Stamp It! Cards and an assortment of itty bitty stamps. All comments must be received by midnight (MST) on Wednesday, July 22. Congrats, winners! 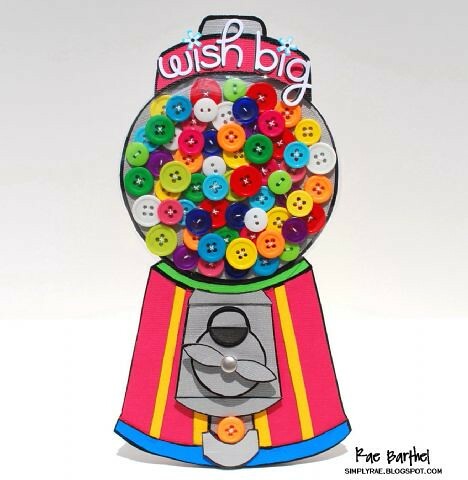 You’ve each won two bags of Papertrey Ink buttons! Kelly will be contacting you shortly for your mailing addresses! Thanks to all who left comments on their favorite way to use buttons! Speaking of buttons… that’s the theme for Round 3 in our Gallery Idol competition. 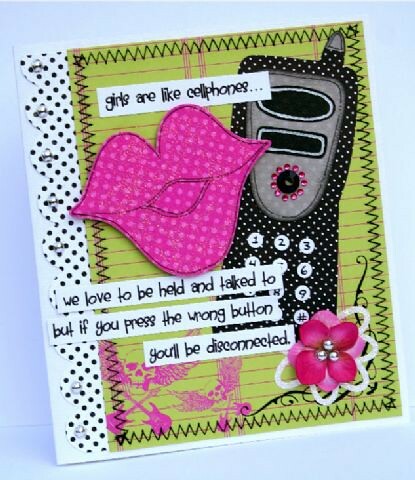 Click here to view these 10 amazing button-infused cards. And make sure you cast your vote for your favorite design! Welcome to Magazine Monday! I hope you all had a great weekend! When Brandy offered me this internship, she cautioned that what I got out of it would be determined by what I put into it. My first couple days were a blur; I had no idea what was going on. To put it bluntly, my enthusiasm for paper crafts exceeded my ability… never a good combination. Luckily for me, the Paper Crafts team was there to help at every step, and answer any and every question I had. I’ve learned a lot interning at Paper Crafts. Can you believe I’ve learned all this in two months?! I discovered or perhaps re-discovered my inner paper craftress. I will have you know that since starting at Paper Crafts, I have made five cards and a project. It’s a start! I learned how to set up cards for photography shots. As a result of said supply lists, I am a self-proclaimed expert with Papertrey Ink’s Perfect Match Cardstock. Aqua Mist, anyone? I scratched the surface on learning the inner workings of a magazine. I learned how to do “returns” – mailing projects and complimentary issues back to card designers. 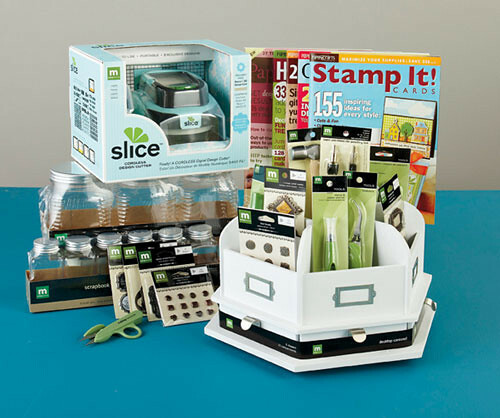 I learned about trends in paper and product; I didn’t know there was so much product out there! I’ve learned that I want to work here, and I wish my tenure as an intern with Paper Crafts was not coming to a close! In short, I have loved every minute of working at Paper Crafts and I have learned more than I could in any other setting. I didn’t know what I was going into, but I learned along the way (with lots and lots of help!) and I will really miss my daily dose of creativity from you readers, and of course, the lovely ladies at Paper Crafts! Pausing for a photo with my Paper Crafts friends. Congrats, ladies! You’ve each won a stamp set from Papertrey Ink. Kelly will be contacting you shortly for your mailing addresses. Thanks to all who left so many (527 and counting!) comments for Betsy! Make sure you check back here tomorrow when we reveal the identity of mystery Go-to Gal #5!